Join your immortal undead friends for a stroll through the cemetery with these punk goth-style angular lense sunglasses. 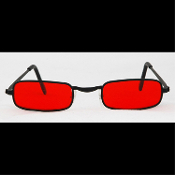 Feature BLOOD RED tinted rectangular sarcophagus coffin-shaped UV400 black rimmed lenses. - Costume suggestions: grave digger, crypt keeper, dungeon master, industrial goth, etc.